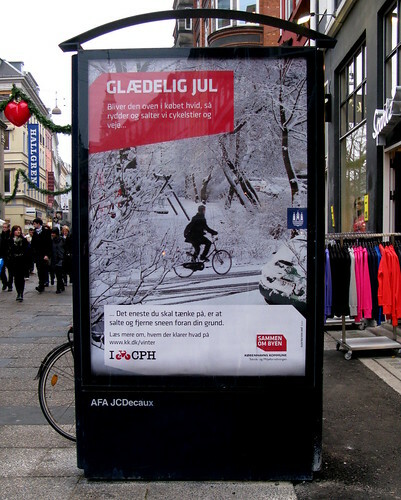 Public service poster from the City of Copenhagen about the winter weather. Featuring a lovely photo of a cyclist in a winter wonderland. Happy Christmas. If it turns out to be white we'll clear the snow and salt the bike lanes and roads. The only thing you have to do is clear the snow and salt the sidewalk in front of your property. Read more about who does what on kk.dk/vinter. Such a lovely tone and a pleasant photo. Nice.